North Country Road Middle School (NCRMS) in Miller Place is busy embracing the digital age with well-known children’s author Dusti Bowling. 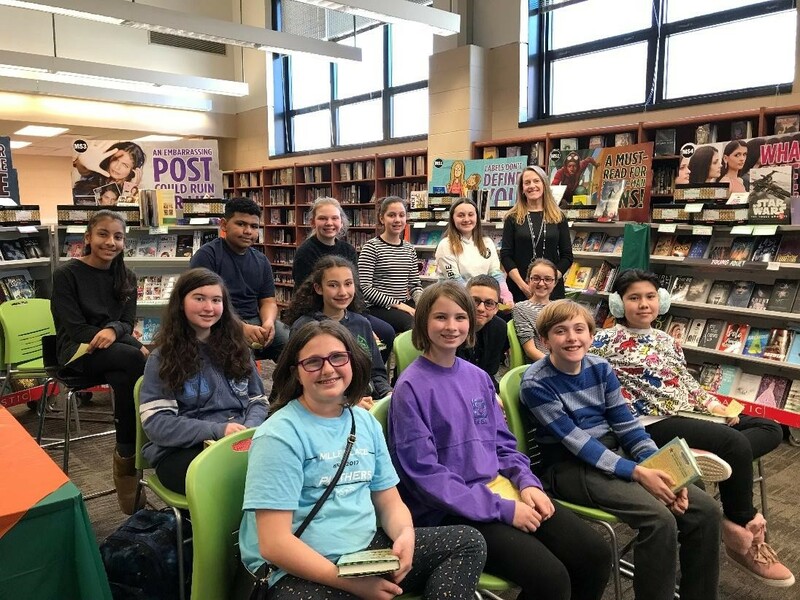 After recently completing Ms. Bowling’s first book Insignificant Events in the Life of a Cactus, NCRMS’s Book Club welcomed the children’s author via Skype to gather insight on her writing secrets and have an in-depth discussion on their favorite book. Spearheaded by NCRMS’s librarian Ronnie Farrell, students were eager to meet Ms. Bowling, learn more about her passion for writing, and dive deeper into the book’s underlining message. Members of the NCRMS Book Club had several questions for Ms. Bowling including how old she was when she first realized she wanted to be a writer and what was her favorite pet Ms. Bowling’s enthusiasm and eagerness to answer each student’s question made for a very engaging and productive visit. The Skype visit concluded with a sneak peek into Ms. Bowling’s upcoming book Momentous Events in the Life of a Cactus, which is pending release for September 2019. Ms. Bowling’s Insignificant Events in the Life of a Cactus is a tremendous story of hope, strength, and letting the light shine on who you truly are. Aven, the book’s main character, who was born with no arms was faced with new challenges as her family relocated to Arizona. With two new pals who face differences of their own, Aven learns that their light can shine just as brightly as anyone else’s. The heartwarming and inspiring story taught Miller Place’s students the significance of acceptance and understanding. Dusti Bowling, who currently resides in Arizona with her family and army of pets, has had a passion for reading since her youth. She composes various books for young adult and middle grade students. North Country Road Middle School in Miller Place recently used their voices to advocate for the rights, inclusion and wellbeing of individuals with Down Syndrome during World Down Syndrome Day (WDSD) on March 21, 2019. 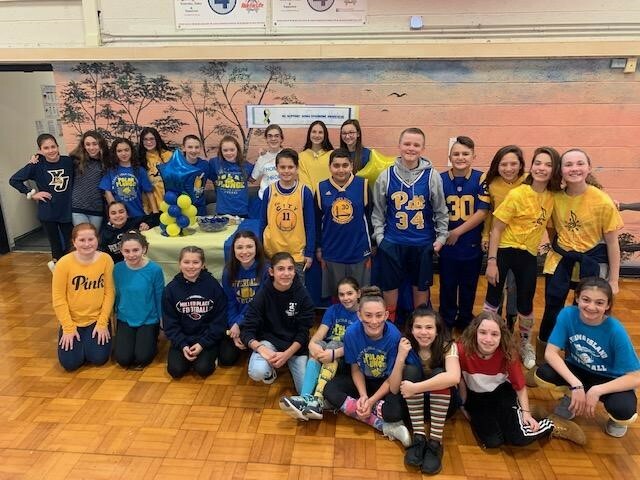 Together, students at NCRMS dressed up in blue and yellow to raise awareness and sold bracelets to fundraise for the cause. “This small but immensely impactful initiative—spearheaded by Student Government—helps instill in our students a sense of empathy and understanding, two characteristics that are immensely valued throughout the District,” said Dr. Marianne Cartisano, superintendent of Miller Place School District. NCRMS’s Student Government spearheaded the initiative under the direction of Nicole Farley and Mara Healey. The group of students set up a table and rotated shifts to sell blue and yellow bracelets to their peers and staff members in the building—all proceeds donated to the cause. World Down Syndrome Day is a global awareness day that began in 2006. The date for WDSD—the 21st day of the third month—was selected to signify the uniqueness of the triplication (trisomy) of the 21st chromosome which causes Down syndrome. Miller Place School District (MSPD) is proud to announce that Joseph Maronski, member of the National Honor Society at MPHS, has been selected among thousands of applicants as a recipient of a 2018-19 National Honor Society Scholarship. Joseph will receive the scholarship in recognition of his commitment to making a difference in school and the community through his exceptional scholarship, service, leadership and character. The National Association of Secondary School Principals (NASSP), parent organization of NHS, has awarded more than $15 million in scholarships to outstanding NHS members since 1946. Of the 600 recipients, one national winner receives a $25,000 scholarship, 24 national finalists are each awarded a $5,625 scholarship, and 575 national semifinalists are awarded a $3,200 scholarship each. NASSP is committed to providing additional resources to assist students and families face the rising costs of higher education. 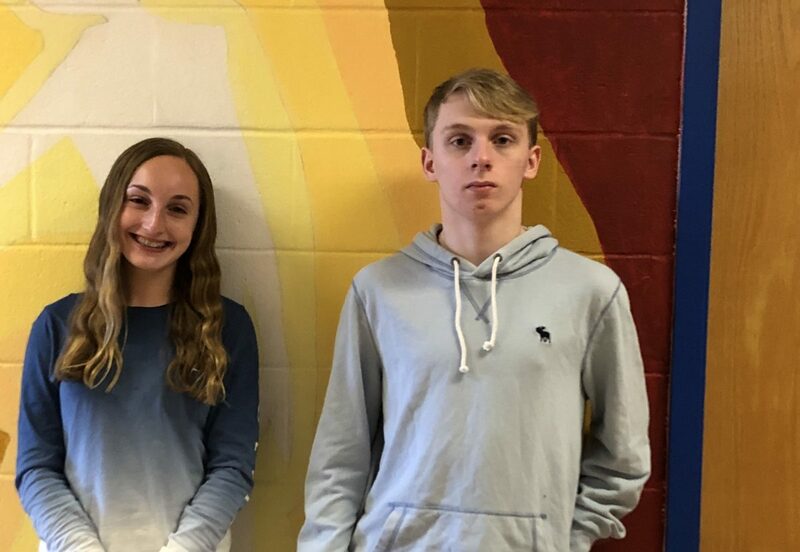 Miller Place School District is thrilled to announce the success of two students—James McCarthy and Kylie Mistretta—who were named finalists in the 2018 Ayn Rand Essay Contest. Finalist James and Semi-finalist Kylie each submitted essays through their English Honors Class. Mr. Zeltman, English Honors teacher at MPHS, was overjoyed to discover that Kylie and James were both selected as finalists. 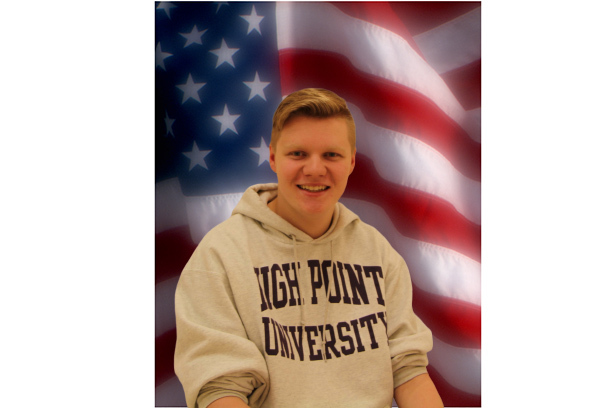 Aside from his passion for writing, Jake enjoys learning about history and has plans to continue onto higher education after high school, majoring in journalism. Outside of school, James can be found fencing. Kylie has always had a passion for reading as well as writing. She enjoys reading adventure stories the most. Kylie entered a poetry contest in this year’s English class, and recently found out that she is being published in Creative Communications Magazine. Aside from her schoolwork, she is in the Miller Place High School Service Club and enjoys archery as a hobby. Kylie has been on the Varsity Soccer Team for two years and is also involved with the Stony Brook Travel Team. For over 30 years, the Ayn Rand Institute has held essay contests for students all over the world. The contest is in honor of writer and philosopher Ayn Rand, who defected from Russia during the Communist Era. The 2018 Ayn Rand Essay Contest received over a thousand student entries world-wide. 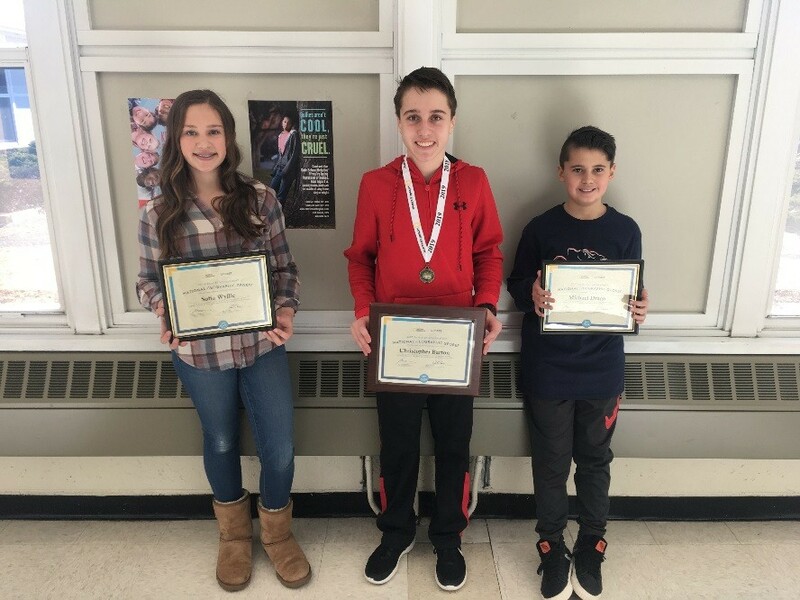 The Miller Place School District is celebrating the success of three notable students—Christopher Barton, Michael Drago and Sofia Wyllie—from North Country Road Middle School (NCRMS) who recently competed for the National Geographic GeoBee competition. The academic competition, held annually, is designed to promote geographic knowledge among young people in the United States. 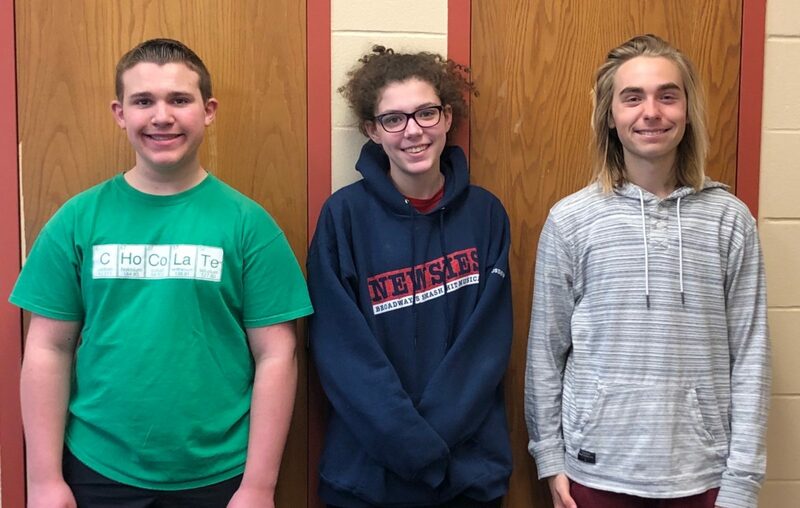 North Country Road’s winners—Christopher Barton, 1st place; Michael Drago, 2nd place; and Sofia Wylli, 3rd place—were ranked as the building’s highest scorers for this year’s competition. The National Geographic GeoBee includes three levels of competition: school, state and national. The school’s champion—Christopher—then takes a proctored online qualifying exam for the state level and the top 100 ranked students in each state are chosen to represent their school. State champions then travel to national Geographic headquarters in Washington, D.C., to compete in the national championship. The contest aims to encourage teachers to include geography in their classrooms, inspire and reward students’ curiosity about the world, and increase public awareness about geography. Students compete for a chance to win college scholarships and the glory of being the National Geographic GeoBee Champion. Miller Place School District (MPSD) recently held its second annual STEAM (Science, Technology, Engineering, Art and Mathematics) Night. Hosted by North Country Road Middle School, more than 130 students participated in a multitude of engaging and stimulating events. Students collaborated with many of their peers as they harnessed their creativity and knowledge to design their own original inventions and experiments. Students in grades six through eight participated in interactive workshops that explored several elements of STEAM including fundamental game and coding concepts for video game coding, food science experiments, mobile planetariums that explored star lifecycles and blackholes, and Rube Goldberg Machines. These engaging activities allowed students to explore their interests and hobbies in a unique educational environment. 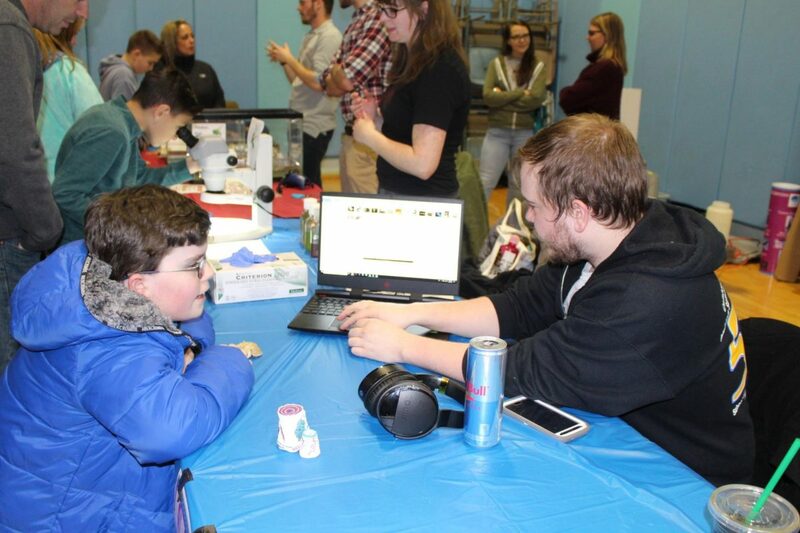 STEAM night was held at the Expo Center, put on by teachers of North Country Road Middle School, TESLA Science Center, LI Science Center, Microsoft, Brookhaven National Lab, Stony Brook Innovation Lab and Stony Brook Grads and Educational Outreach. There were two, 45-minute sessions, allowing each student to choose from two activities. The maximum number of participants for each activity ranged from 10 to 30. Students and parents from North Country Road Middle School were invited to participate. While high school students throughout the nation are reviewing notes and practice exams to prepare for upcoming Advanced Placement exams, students at Miller Place High School (MPHS) are taking a unique approach. 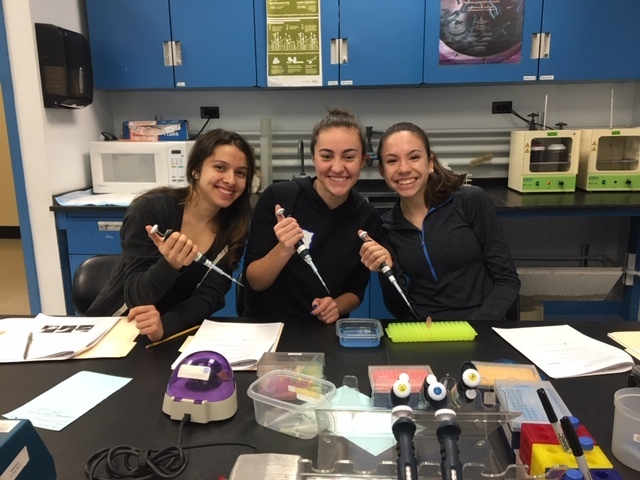 Students currently enrolled in the District’s AP Biology course recently explored Stony Brook University’s Biotechnology Teaching Lab to interact with professional scientists and explore modern technology that utilizes biological systems. The aspiring biologists explored extensive research in genetic engineering, including the CRISPR technique. While completing labs, students learned how to use the unique equipment involved in biotechnology education like centrifuges, chillettes, micropipettes, and vortex shakers to complete their lab. Kalliopi Gasparis, AP Biology student at MPHS, said she “felt like a professional scientist” during her day at Stony Brook University. Students worked with two different restriction enzymes and learned how these enzymes cleave or cut DNA, how to use and prepare a gel using gel electrophoresis and how to change the genotype of Escherichia coli (E.coli) by transformation. Following the labs, students ventured through the student union to have lunch for an inside look at the university. Advanced Placement is an academic program that provides high school students with college-level rigor while still in high school. Students are eligible to earn college credit or advanced standing by achieving a score of 3 (out of 5) or higher on AP course exams. The Miller Place School District aims to set its students up for a successful future and secondary education by offering several opportunities to study subjects in greater depth and offer experiences that broaden their horizons, thus providing them with new insights into their own skills and interests. Last summer, three of Miller Place High School’s musicians—Larry Davis, William Dunlop and Zoe Bussewitz—took their talents overseas on a two-week European concert tour with the Nassau and Suffolk Chapter of the Metropolitan Youth Orchestra. These three musicians were among 70 students from Nassau and Suffolk selected to perform in this ensemble that performed throughout Berlin, Dresden, Prague, Vienna, and Budapest. Larry Davis, who plays the French horn, is a member of the MPHS Symphonic Band and Jazz Band. Throughout Larry’s musical career, he has participated in the Suffolk County Music Educators Association (SCMEA) and is an active member of the Nassau/Suffolk Jazz Ensemble. Larry is considering pursuing a minor in music when he reaches college. William Dunlop, a member of the MPHS Symphonic and Jazz Band and Zoe Bussewitz, member of the MPHS Orchestra, are also notable participants of SCMEA. Aside from their musical endeavors in school, William is a member of the Suffolk County Boy Scouts and Zoe is a member of the Girl Scouts of Suffolk County. Zoe is also involved in the drama club, student government and the MPHS Gay-Straight Alliance group. 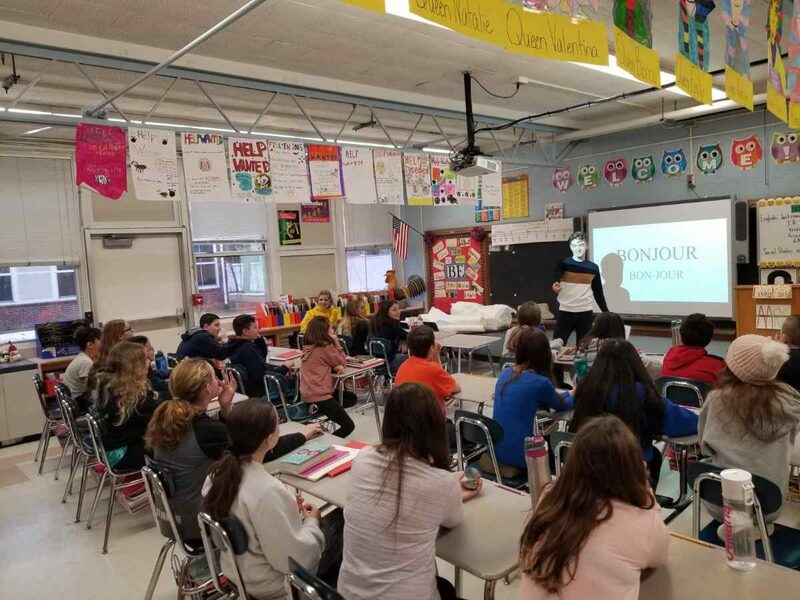 North Country Road Middle School’s sixth grade students ventured on a journey around the world to explore course offerings with members of the Miller Place High School Foreign Language National Honor Society (FLNHS). As part of the District’s efforts to create a deeper understanding of and appreciation for humanity and culture, at the end of sixth grade students are required to select one of three languages—Spanish, French or Italian—to pursue throughout the seventh grade. In an effort to prepare the young students as they begin their course selections, members of the FLNHS led in-depth presentations, detailing various aspects of what each language course offers, such as the study of basic vocabulary and the food and other traditions of the culture. Miller Place’s sixth graders gained valuable knowledge about what each language option entails, providing them with a solid foundation to begin their cultural education and confidence as they finalize their schedules for the 2019-2020 academic year. 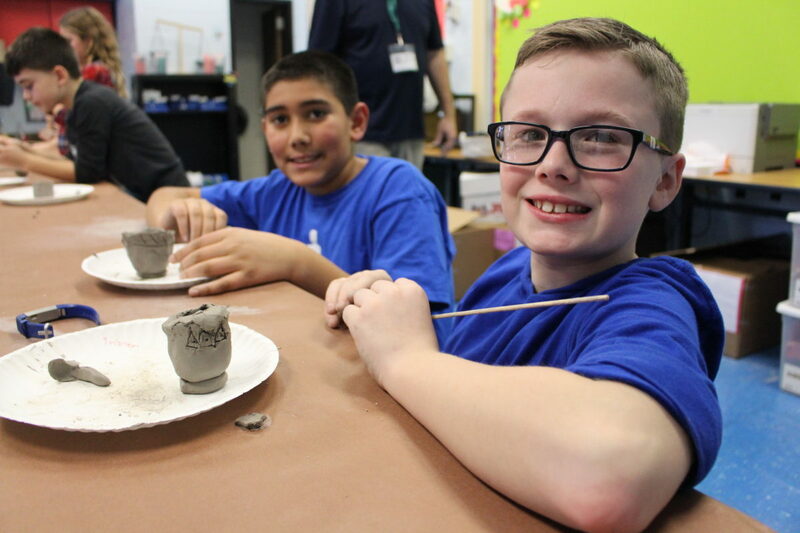 Miller Place students in fourth grade at Laddie A. Decker Sound Beach School explored Native American culture after transforming the elementary school into a temporary Native American museum. Each class in the fourth grade attended an Eastern Woodlands full-day workshop program which included a museum presentation, traditional stories and games, crafts, singing and dancing, and much more. Students were given the opportunity to help lead the group with the speaker in the demonstration and storytelling portions of the day. Students even got up close and personal with replica Native American artifacts. The event was designed to be an interactive way to educate students on American origins and the value of understanding diverse cultures. LADSBS’s students enjoyed switching up their daily routine to learn about Native American history in a nontraditional classroom setting.